Rank on the first page for your industry’s most sought after keywords. Increased visibility leads to increased revenue. Search Engine Optimization or SEO is the practice of making a website appear or “rank” for various keywords when typed into a search on Google or other search engines. Increasing rankings for highly searched keywords results in higher traffic and increased revenue. Google ranks websites by a complex, ever changing algorithm in order to consistently provide the best and most fair results for their users. There are no tricks or short-cuts to high ranking SEO. You have to give Google precisely what it’s looking for, and we know how. Local SEO is one of the most important keys to every business’s success. Ranking for your specified keywords in your own geo-location through search engines, on maps and in reviews is critical to SEO marketing for those looking to increase revenue. It’s estimated that 98% of internet searchers do not go past the top 10 results of their search. With the addition of Maps and Reviews as supplementary places for your business to rank, we make sure your are correctly submitted and optimized for each. Whether a potential client is searching from their desktop, tablet or mobile device we make sure your website is found. Wondering how your site measures up? Enter for a free, no-obligation SEO audit. Before any Search Engine Optimization campaign is ever implemented, it is imperative that an intense amount of research is completed. Every campaign we begin starts with investigating on your business and marketing strategy. We get to know your industry, explore your competitors and analyze the highest traffic keywords. We learn about your products or services, their cost, your overhead and bottom line. An audit of your website is completed, where we rebuild the pages, edit the content and rename tags and images. We gather information about your current online presence, your social media, and your online reputation through reviews and testimonials. A duplicate copy check is done across the web in conjunction with a review of page load time, site security, trust, and authority. We also check Internet wide for any inaccurate information about your company like phone numbers, locations, employee names and more. Understanding your competition and where they succeed or fail, is paramount to every marketing campaign. We research what keywords are searched most often and complete a cost analysis of what is attainable for your budget. We help search engines understand what keywords each page of your website is trying to rank for through hard code and on page content. Keyword density, relevancy, readability, word count, semantically related words and more playing into your ranking. Trust, reputation, quality of information, inbound and outbound links and other factors determine if your site is relevant. Has your information been submitted? Is it correct? Is it up to date? 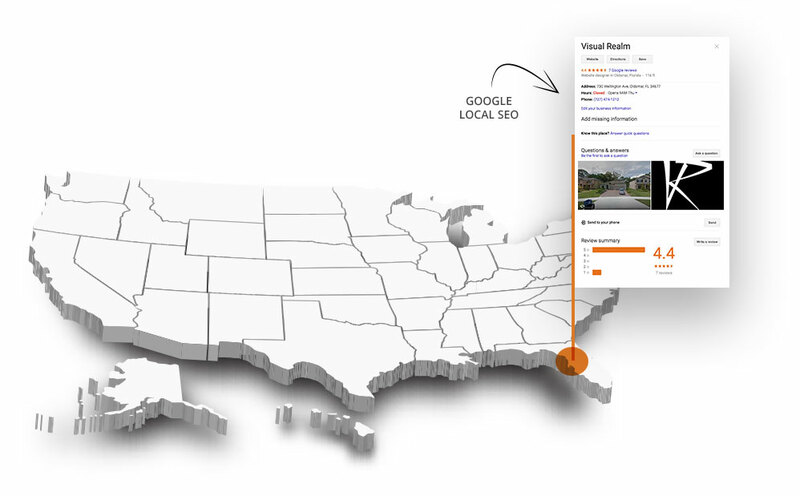 Local search is an extremely important factor for SEO. Almost 90% of consumers report online reviews or testimonials as an important factor in determining their choice. Relevant, quality links help search engines determine if/how you should rank for your desired keywords. Similar to back links, social media or social signals help search engines determine relevance, trust, and engagement. An SSL (Secure Sockets Layer) certificate adds an additional layer of security and privacy to your site’s data. Data added to your webpage that creates a description to help search engines qualify your information and return results for users. Continually producing fresh, relevant, keyword rich content is a great way to increase visitors, engagement and rank. Building relationships, authority, back links, exposure, traffic and growing your audience helps search engines rank you. Slow load speed increases bounce rate and leads to poor customer experience which decreases overall traffic. We get the #1 rankings we want for ourselves. Googling an SEO company’s keywords is a great way to find out if they know SEO. 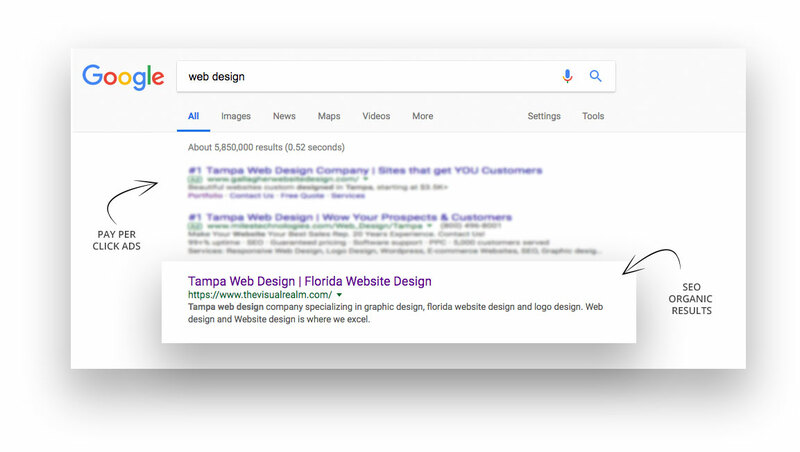 Why do business with an Tampa SEO team which can’t even get itself ranked highly, let alone its clients?